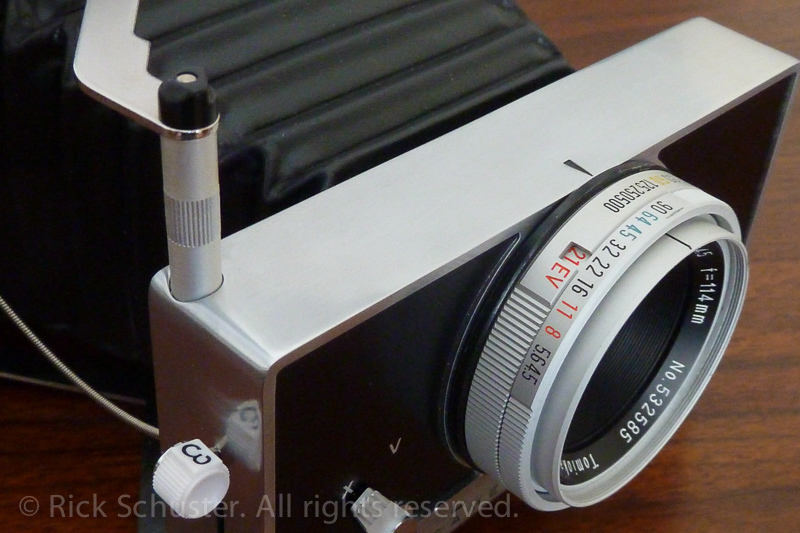 To see photos shot with this camera, click the appropriate Category link at right. 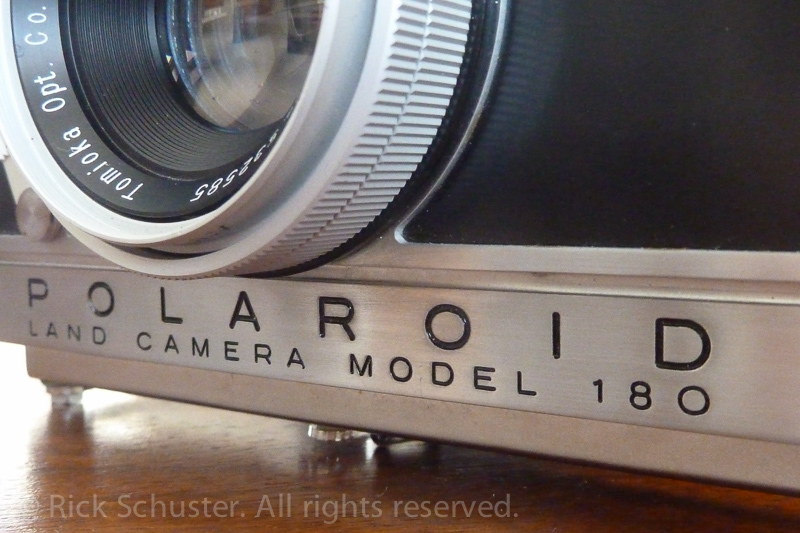 The Polaroid 180 is well-known as the top-of-the-line Polaroid camera. 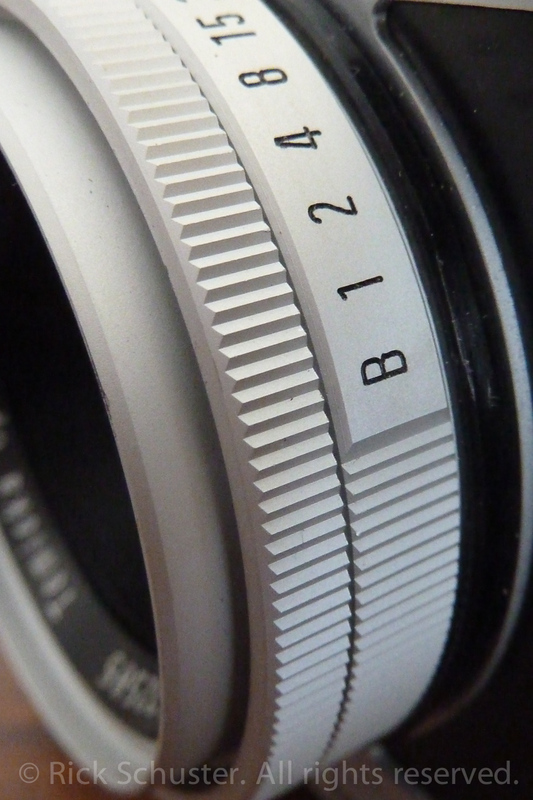 The combination of high-quality metal construction, Zeiss viewfinder/rangefinder, high-quality Tominon lens, and fully manual control made this a camera coveted by professionals. 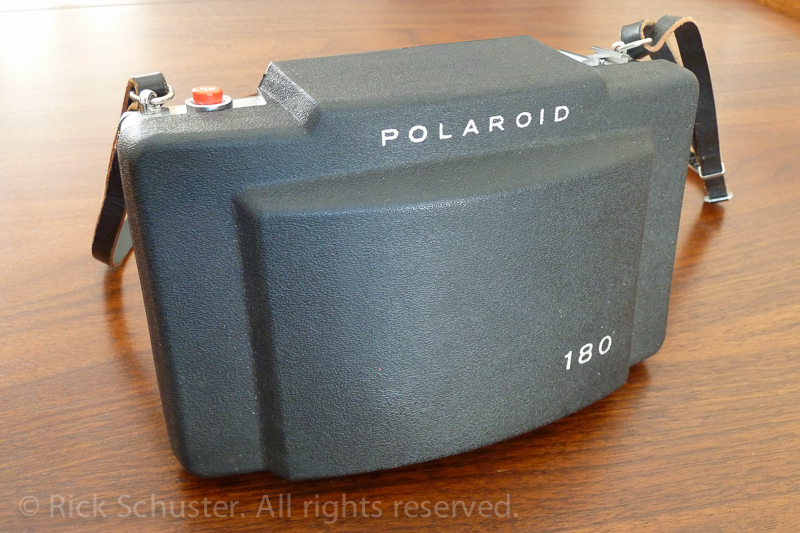 It was produced from 1965 to 1969, and one source I found online stated that the original retail price was $189.95, and that they produced over 51,000 of them. The ones that are still around today and are fully functional are highly prized. When I picked this up at a yard sale, I had no idea what a gem I had just found. I thought it was the type of Polaroid camera that I had read about that still had film available, so I figured I’d give it a try. When I got home and looked at the lens is when I first realized this was something special. 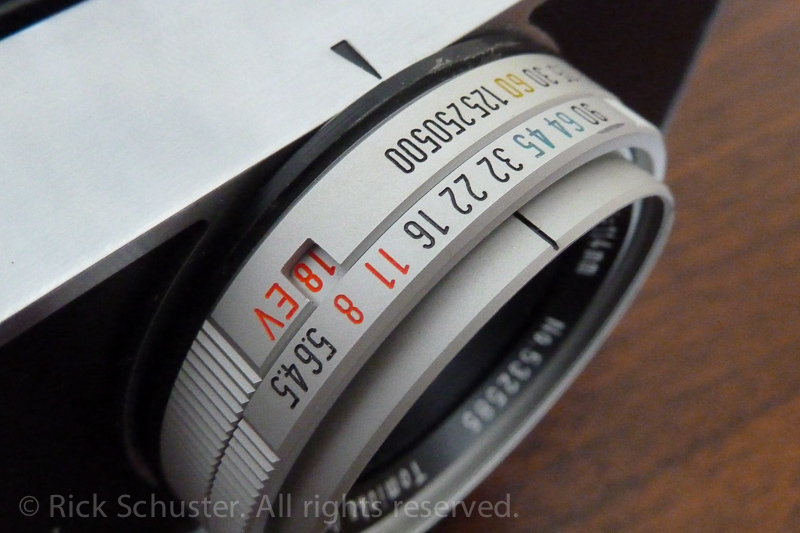 What struck me right away was the quality look, feel, fit and finish of the machined anodized aluminum (I’m guessing, but that seems like what the material is) lens housing and aperture/shutter speed rings. There is a feeling of quality that hits you right away, especially when you feel it and start turning the rings. Some quick research told me I had indeed lucked upon a gem. 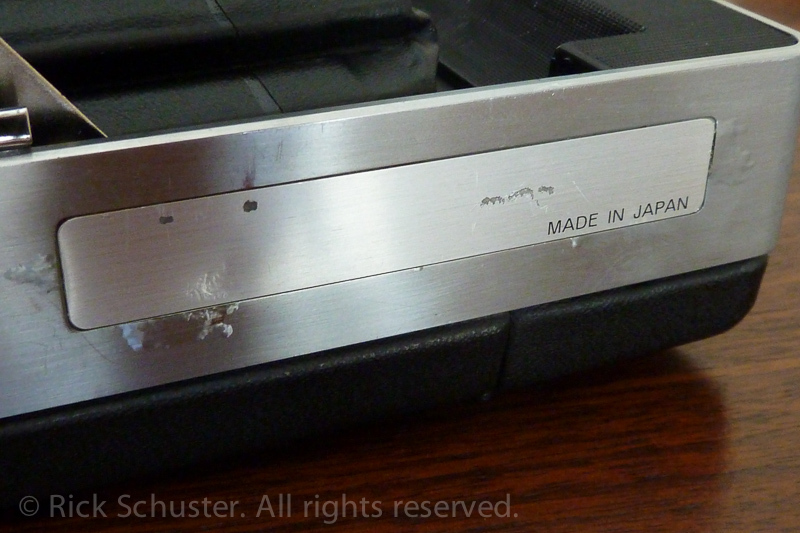 I’ve always dreamed of finding an old Leica at a yard sale, and this is as close as I’ve ever come to that happening. 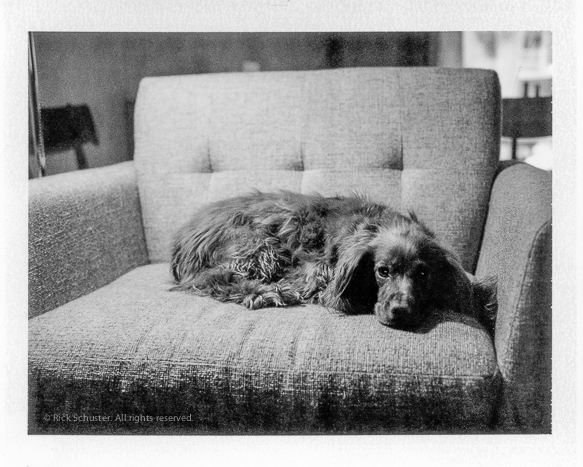 I ordered some Fuji film (Fuji FP-100C color and Fuji FP-3000B black and white) for it from Adorama and had some fun shooting with it. 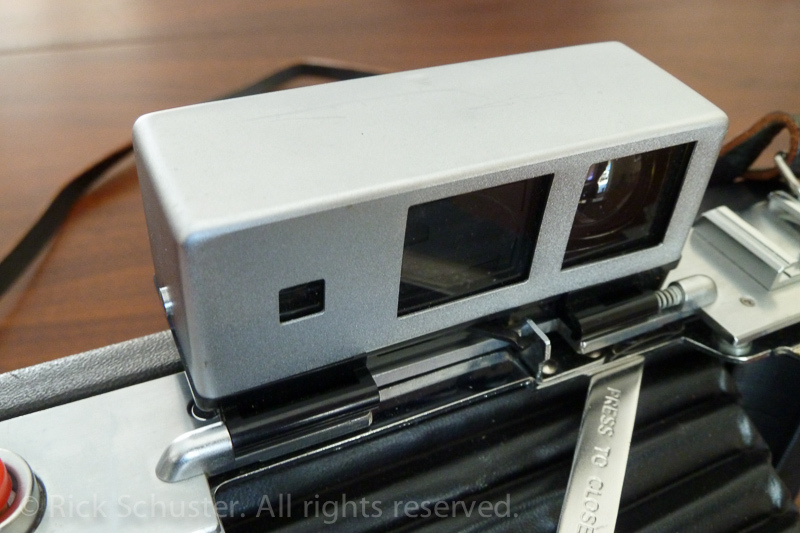 The rangefinder/viewfinder is big and bright, making it easy to view even with my glasses on, and easy to focus. 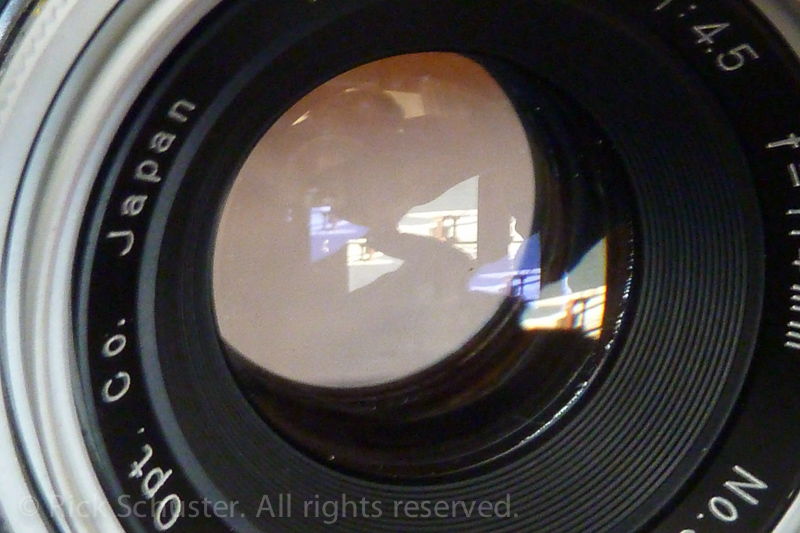 It doesn’t focus terribly close (about 3.5 feet minimum), but a close-up lens adapter is available. 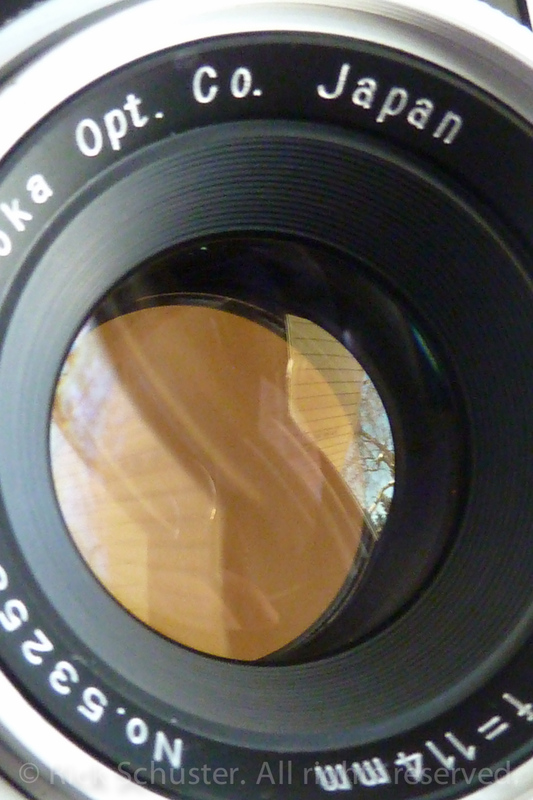 The lens stops down to a crazy f/90 — that’s almost like a pin-hole. 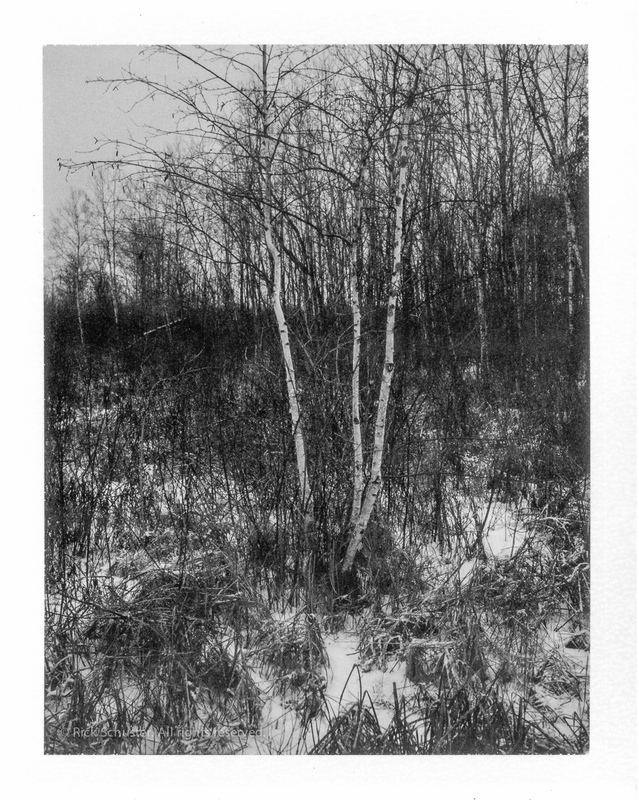 Not sure why it stops down so far, though I may have shot with it stopped down all the way when using the 3000-speed black and white film in daylight. 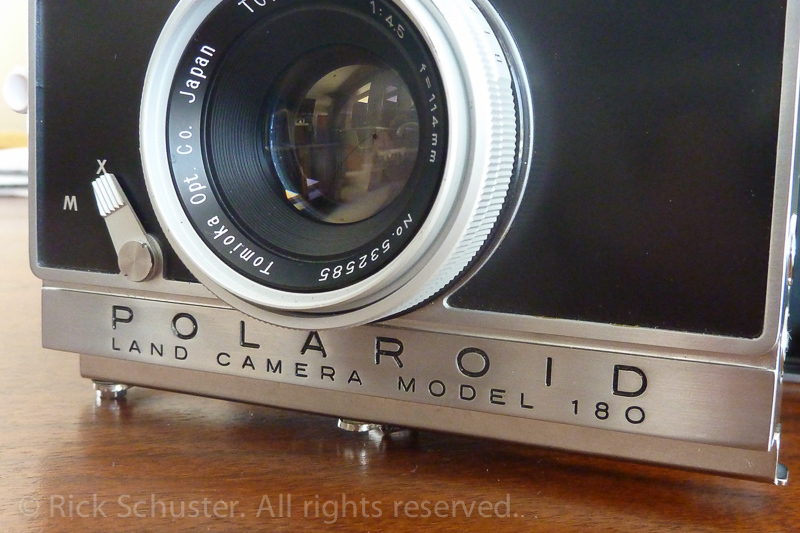 My overall impression of it is that it’s a beautifully made, and well-designed camera. I’ll get into some of the functional things about it below in the photo captions. It’s fun to use, though a little large to carry around a lot. 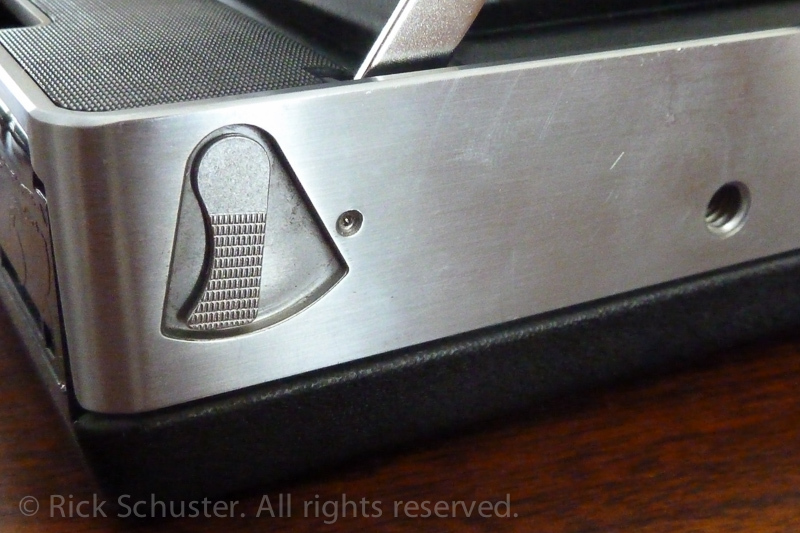 The large size is slightly compensated for with the self-contained cover, so there’s no need to carry it in a case. And it’s pretty light for it’s size, making it easy to handle. I’ve had a lot of fun shooting with it, but haven’t really pulled it out and used it all that much. I should. 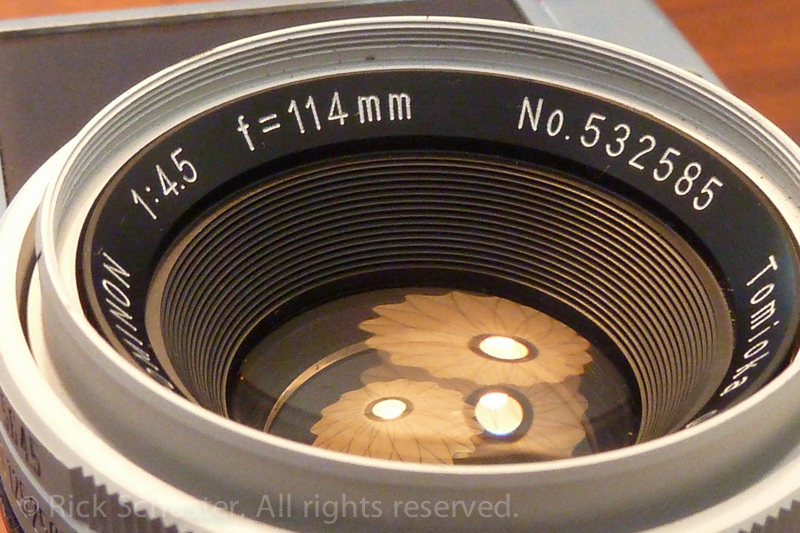 Yes, that aperture ring goes down to f/90 ! Here you can see the EV setting. The shutter speed ring and aperture ring easily turn together, so once you have the exposure set properly (whether you’re referencing the EV number or not), you can easily turn both rings together to reach your desired aperture and/or shutter speed without changing the overall exposure. 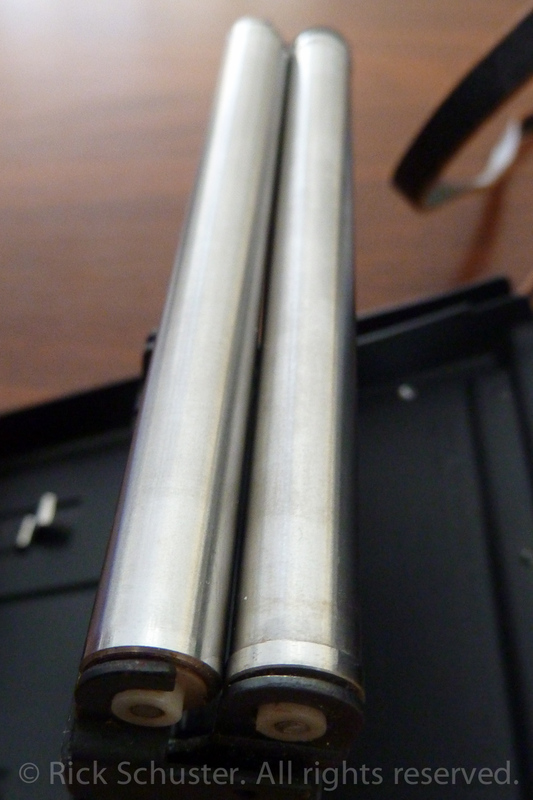 The front cover swings open (a magnet holds it closed at the top of the camera), then a metal clip can be released to remove the cover completely. Though you can shoot with the cover on, I prefer to remove it completely when shooting. 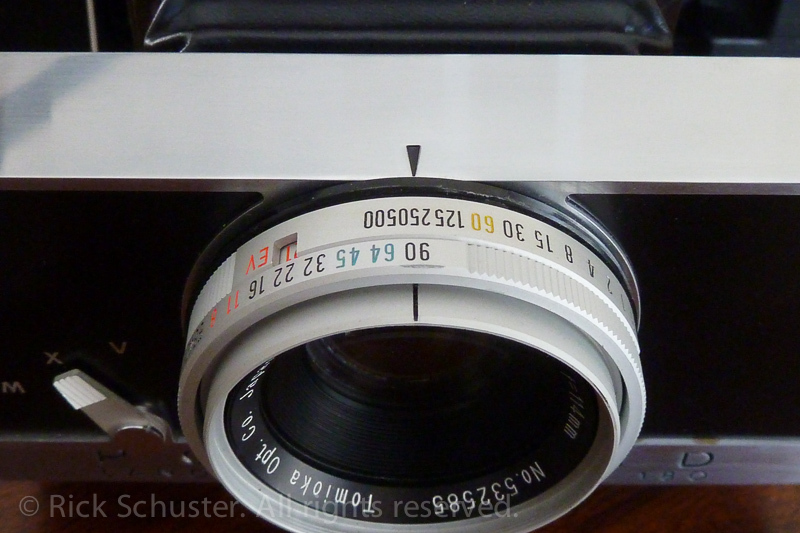 The Zeiss rangefinder swings upward after you open the cover, and a magnet snaps it firmly into place. Pushing gently upward on the tab where the distance scale is (you can barely see the white upward arrow at the bottom of this photo) allows the bellows to extend. It pops out a little bit by itself, but I give the knob a little pull to extend it fully and lock the bellows into place. 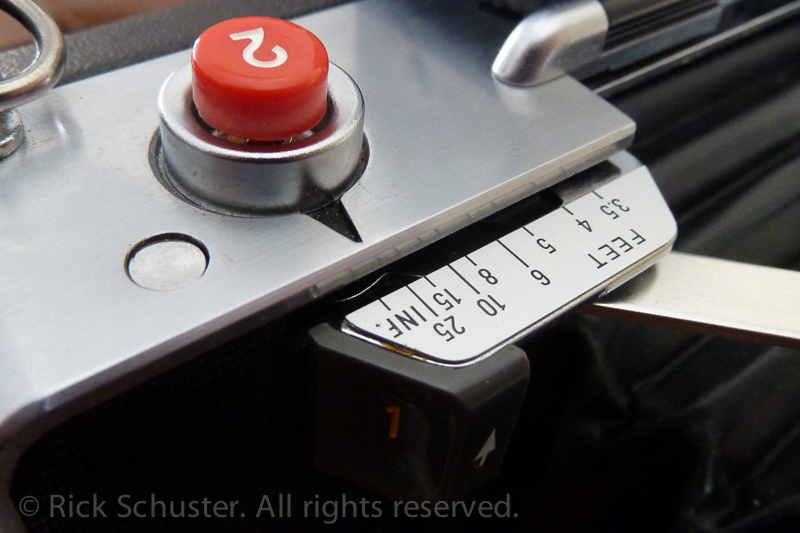 The big red button is the shutter button. Can’t miss that. I usually switch the order around, cocking the shutter just before focusing and firing. I don’t like the idea of leaving the shutter cocked. 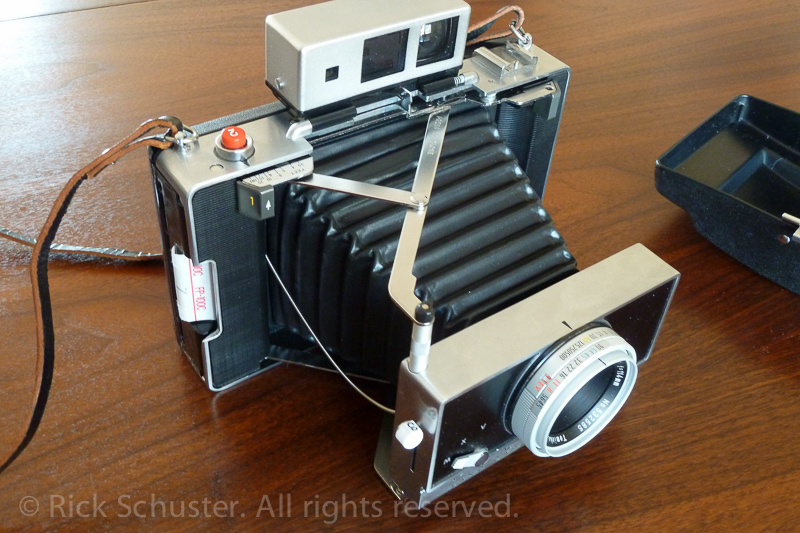 I only ever had one problem with this camera, and that was when the shutter wasn’t always firing when the button was pushed. It turned out to be a really simple fix, so if this happens to you, here’s the first thing to check. 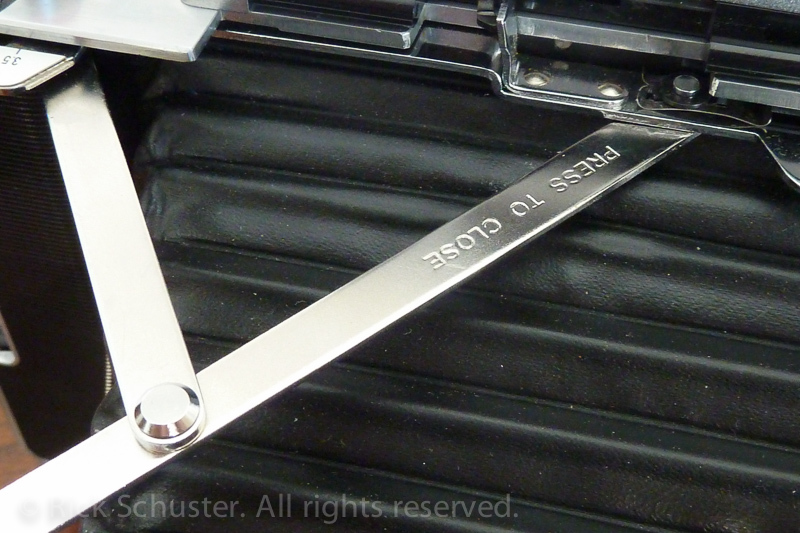 On the rear of the lens board, there’s a chrome plate with three screws where the shutter cable attaches (right behind the “3” shutter cocking lever in the photo above). If you loosen those screws, you can adjust the position of the cable so that it fires correctly, then re-tighten the screws. I took the plate off, but found that I wouldn’t have had to. The bottom part of the plate has some notches that grab the outer coiled part of the cable and hold it in place. This had simply slipped down a little so the inner part of the cable wasn’t sliding up far enough to fire the shutter. I love it when fixes are this easy. Focusing is done by pushing left and right on the two tabs numbered “1”. It’s a nice smooth method that feels good — an index finger on each tab allows easy and smooth focusing. 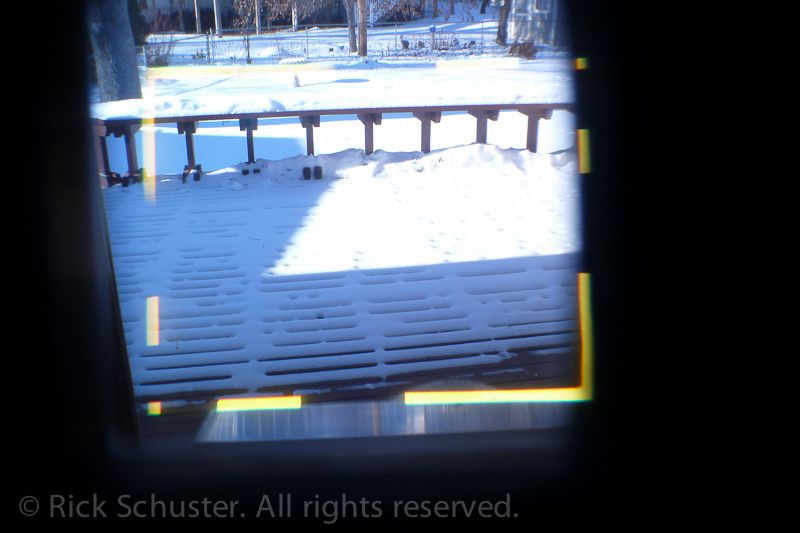 It was hard to take a photo through the viewfinder, but this gives you a little bit of an idea of the big bright viewfinder/rangefinder with bright framelines. I didn’t position the camera quite right so you can’t see the center rangefinder spot, but it’s a nice bright yellow rectangle in the center of the frame. To close the camera, you push gently down on this arm, and push the front back into the camera using the round knurled knob (photo below). 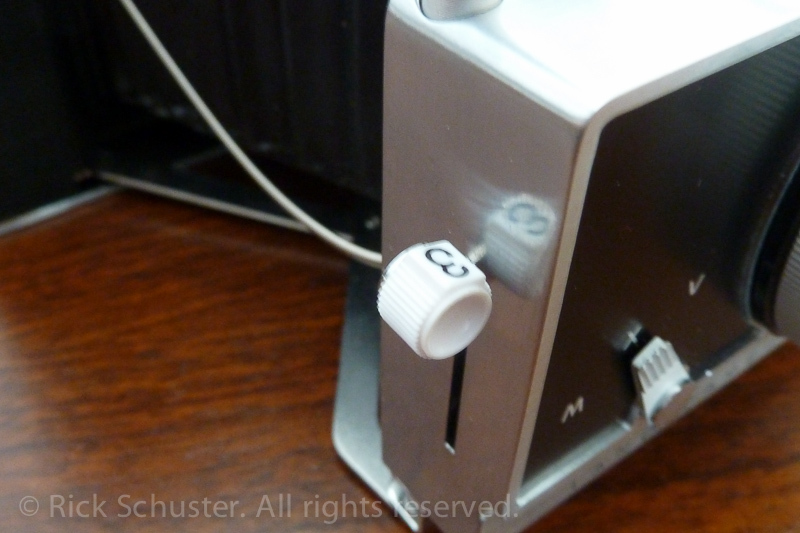 Pull the front of the camera out (and back in) using this knurled knob. I have a little bit of chrome bubbling on the bottom side. 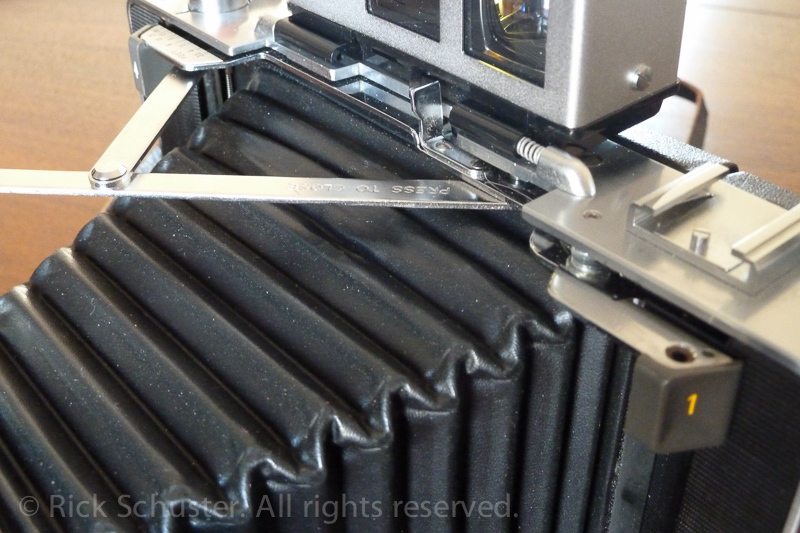 This lever opens the back of the camera for removing a used film pack and loading a new one. 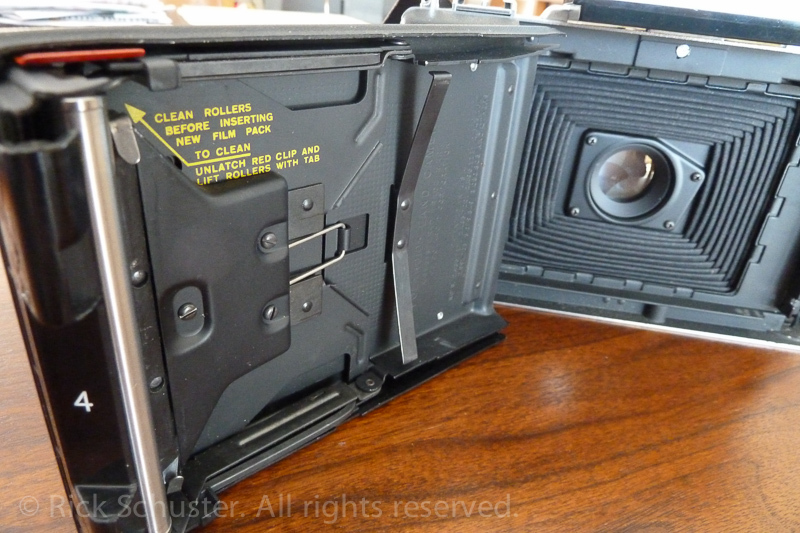 Here’s the camera opened with a used-up film pack ready to be removed. The rollers should always be cleaned after you remove a used film pack. Chemicals from the film can seep out onto the rollers, and any corrosion or bumps on the rollers can affect your images. Never scrape the rollers with anything! 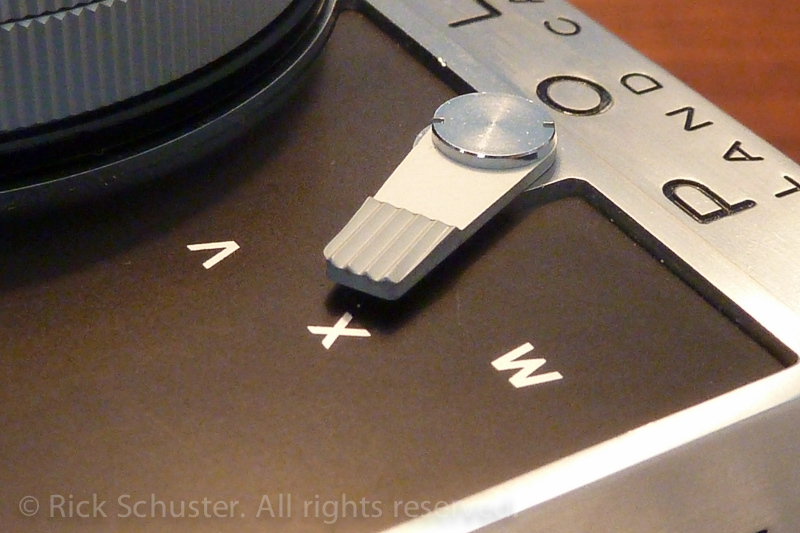 The M and X settings are for flash synching. I’ve not used a flash with it, so I don’t care if it’s on X or M. I guess I’ve usually left it on X. The V setting is the self-timer. Using a self-timer on any old camera that has been sitting unused for a long time is risky because some old self-timers won’t wind all the way down, then may freeze your shutter. I was lucky enough that the self-timer on this one works fine. I think I tried it the first time without thinking about it, or not realizing what the V meant, and it worked, so I’ve used it a few times and it continues to work fine. I’ve had some other old cameras that it was a problem on, so I’m usually wary of setting any old camera to the self-timer setting. 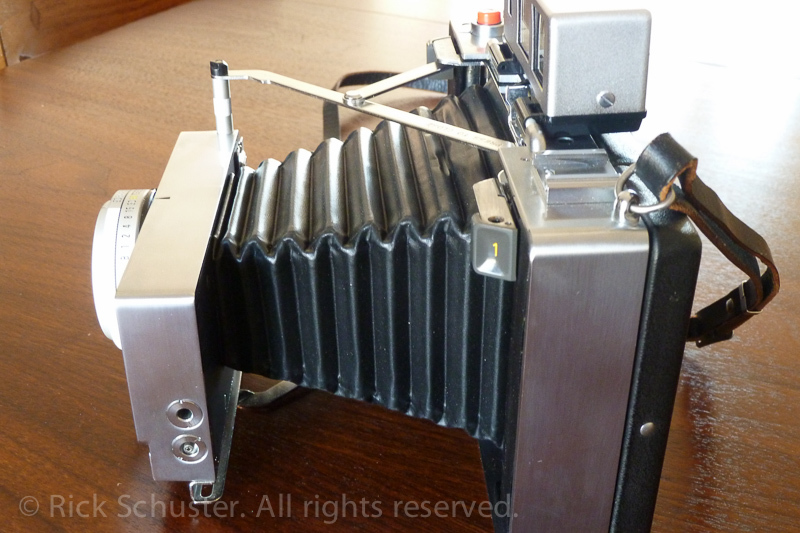 Here’s the inside of the camera with the old film pack removed, and the bellows closed. 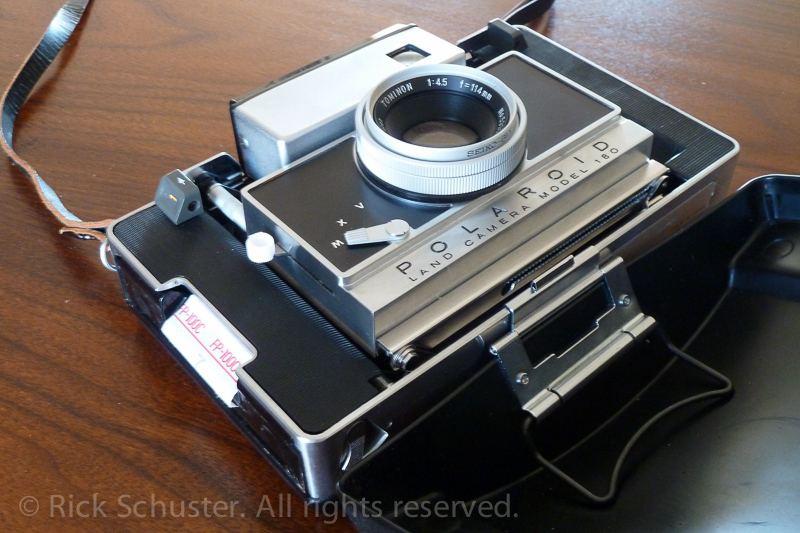 There’s an aluminum decorative plate missing from the right side of my camera, where the film is pulled out after a shot is taken. I’ve been thinking of trying to find a donor camera to take that decorative plate from, but haven’t bothered because it doesn’t affect the use of the camera. The film tab sticks out when the camera is loaded (this is ready to take photo #7 of this film pack). 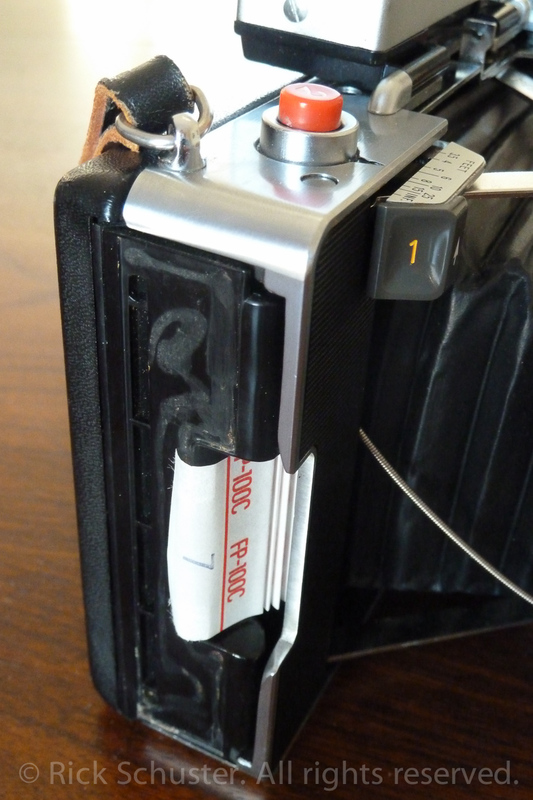 After shooting, you pull out on the tab, and it pulls the film part-way and reveals another tab for you to pull the photo out. 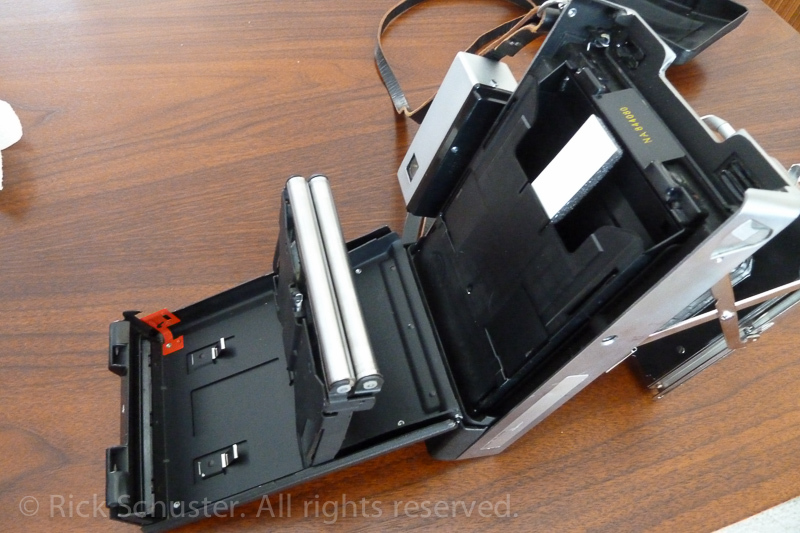 You pull it out in one smooth motion, then wait the proper number of seconds (depending on film type) before peeling the backing paper off of the photo. Top side of the bellows is starting to show a little stretching or ballooning. This might be a sign that the bellows will have to be replaced sometime in the future. 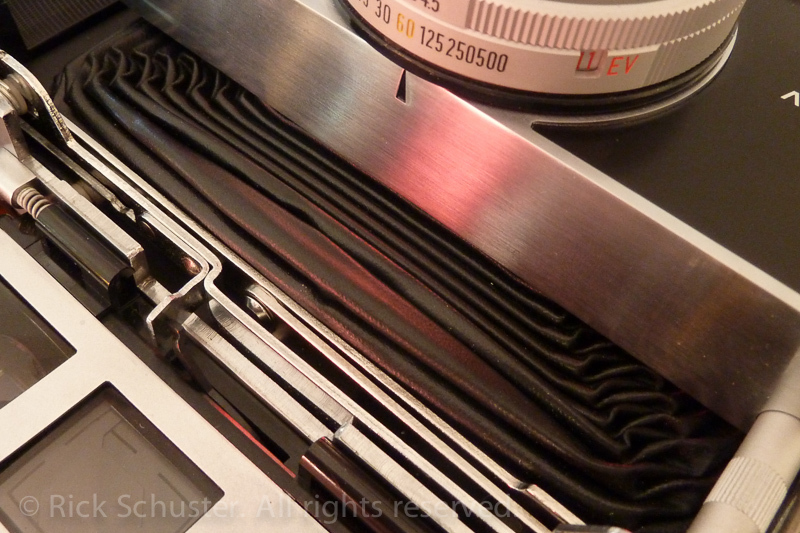 When I fold the camera, the top of the bellows puffs out a little, and I usually gently push in on it as I fold it. You can see in the photo below how it’s ballooned a little bit after being folded.